“Where is Farmer Fred today?” asked Mrs. Tomato, as she was waiting for Christopher Corn and Calvin Carrot to finishing practicing a drum solo. “I heard he is sick with the flu,” said Olive Onion. “Perhaps we should try to keep the music as low as possible,” said Olive. Mrs. Tomato and Olive talked with Christopher. He agreed that they should keep their music as low as possible. About a half hour later, the Fresh Veggie family were shocked to see Farmer Fred all wrapped up in a blanket. “What happened to the music?” asked Farmer Fred. “Are you sure?” asked Christopher. “Blast it,” said Farmer Fred. 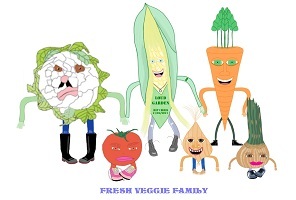 The Fresh Veggie family blasted their music. Farmer Fred went back up to the main house instantly and fell asleep. “Now that was a summer blast,” laughed Christopher the next day when he saw that Farmer Fred was feeling much better. “Yes it was,” said Farmer Fred, also laughing. Loud music is the best. Example: Farmer Fred wanted Loud Garden’s music turned up loud so he could sleep. This entry was posted in Fresh Veggie Family Stories, Grade 3 Level, Summer Stories, Summer Story Challenge 2017 and tagged best, flu, Fresh Veggies, Fresh Veggies Have a Summer Blast, garden, Hope, loud, music, sick, sick with the flu, summer blast. Bookmark the permalink.